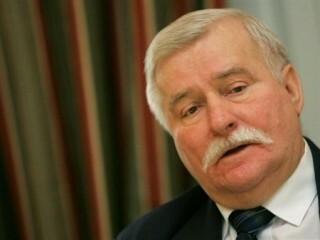 Lech Walesa is a Polish politician, trade-union organizer, and human-rights activist. A charismatic leader, he co-founded Solidarity (Solidarność), the Soviet bloc's first independent trade union, won the Nobel Peace Prize in 1983, and served as President of Poland 1990–95. During the 1980s trade union activist Lech Walesa was the face of Poland's anti-Soviet struggle, and in 1990 he won the presidency in Poland's first free election in half a century. Walesa was a trained electrician working in the Lenin Shipyard in Gdansk when he got involved in union activism around 1970. An organizer of shipyard strikes in the mid-1970s, he lost his job in 1976 over his anti-communist political views. While managing to make a living, he became more involved in demanding rights for workers, and in 1980 his Interfactory Strike Committee evolved into the Solidarity movement (Solidarnosc). With a reported 10 million Polish workers on their side, Solidarity was able to win concessions in the Gdansk Agreement (31 August 1980), and quickly became an all-purpose political group that demanded free elections and openly called for the ouster of the Soviet-backed communist government. When martial law was declared in December of 1981, Walesa's organization was forced underground, and Walesa was arrested and briefly jailed. By the end of 1982 he was back in the shipyards, an international folk hero who was TIME magazine's 1980 Man of the Year. Walesa won the Nobel Peace Prize and was received by Pope John Paul II in 1983, and Solidarity could not be ignored by the government. Legalized again in 1989, Solidarity won concessions in a series of negotiations (the "roundtable talks") and were allowed to run candidates for parliament. Walesa won the presidency in 1990 (9 December), but lost in a bid for re-election in 1995 to former communist Aleksander Kwasniewski. His term was marked by internal struggles within his political party, and by the time he left office he was considerably less popular. He ran for office in 2000, but fared poorly at the polls. Considered a key figure in what led to the collapse of the Soviet Union, Walesa travels the world on the lecture circuit and heads up the Lech Walesa Institute Foundation (est. 1995). View the full website biography of Lech Walesa.